Some of Ivel Sprinter’s volunteer drivers, and dignitaries, at the 25th Anniversary party of the company (East Beds Community Bus Ltd.), more of which you can read later. © Ivel Sprinter. Welcome to BABUS Newsletter 31 This BABUS Newsletter is brought to you by Mrs Suzy Scott, who can be contacted by post at Apartment 4, 3840 Stonehills, WELWYN GARDEN CITY, Hertfordshire, AL8 6PD. 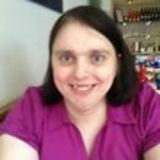 E-mail suzy.scott@babus.org.uk and is produced through her company, Here To There Publishing Ltd. She is our Communations Officer [on a part-time basis]. We welcome contributions and corrections from everyone, and please note that the next Newsletter deadline shall be on 15th February 2017. The BABUS Website is also the responsilibiliy of Suzy Scott (see previous row), and you can find us at www.babus.org.uk. To sign up for the Bulletin Board, which is also there, send Suzy an email with your preferred user name, own name, email, and membership status (i.e. committee, regular member or non-member) so we can set you all up accordingly. We are also on Social Media! Find us on Twitter @BABUSbeds or online at www.twitter.com/BABUSbeds. You can also join our Facebook group www.facebook.com/groups/BABUSbeds/ . Our Treasurer and Membership Secretary is Mr Simon Norton who you can contact by post at 6 Hertford Street, CAMBRIDGE, CB4 3AG or by email to simon.norton@babus.org.uk . Simon can deal with changes of address, change from paper to digital newsletter (or vice-versa,) membership renewals and queries on payments, and accounts payable. For everything else, contact our lovely Sectetary, be addressed to Miss Frances Horwood, BABUS Secretary, 34 Rectory Orchard, Lavendon, OLNEY, MK46 4HB, or by frances.horwood@babus.org.uk . To contact us by telephone, call 0871 218 2287 (BBUS). Leave a message, and we will return your call. We legally need to tell you this costs 12p per minute, plus your Network Operatorâ&#x20AC;&#x2122;s Access Charges. Fax us on the same cost basis â&#x20AC;&#x201C; 0871 218 3293. The Ivel Sprinter Celebrates its 25th Anniversary. Information feature kindly supplied by Gerry Amsden, General Secretary. The Council must make significant savings over the next three years as a result of a reduction in funding from Central Government and rising costs, particularly support for older people with care needs. Like all areas the Council must look at reducing expenditure. These savings can be used to protect other essential Council services like care for the elderly. The Travel and Tourism Centre located at Bedford Bus Station currently provides a range of travel and tourism related services including a high volume of train ticket sales. Cutting the cake are (Left) Gerry Amsden, (Right) – Mayor of Biggleswade, David Albone (next) MP Alastair Burt.© Ivel Sprinter. It is proposed to discontinue services that are available from commercial operators including train and coach tickets and bus travel information and to focus on providing information about tourist attractions in Bedford Borough. In order to reduce costs it is proposed to close the current Travel and Tourism Centre and deliver information mainly through self-service facilities at Council buildings or, potentially, other outlets. The Ivel Sprinter celebrated its 25 years of providing a local volunteer bus service with over 70 people at an Afternoon Tea Party at Biggleswade Conservative Club, attended by our Local Mayor David Albone & Rt Hon. Alastair Burt MP. You can email your views to consultingbedford@bedford.gov.uk or write to us at: Consulting Bedford, Bedford Borough Council, Borough Hall, Cauldwell Street, MK42 9AP. The consultation is open until 19 December. Comments received will be published. A report on the consultation will be taken to the Council's Executive at it's meeting of 18 January 2017. This website will be updated once a decision has been made. groups, residential care homes and local schools. Publicity It is most important to ensure we have continued publicity for awareness of our services, including more voluntary assistance with driving the minibuses, or just supporting the committee. We attend a number of local fetes and carnival parades each year, as well as giving talks to local community groups. In the last year we have been in discussion with our Local Mid Beds Council and Local Town/Parish Councils to provide additional timetable cases and to utilise any space in bus shelters etc. ensuring that our services /timings/availability are better known with the local population for everyoneâ&#x20AC;&#x2122;s benefit. The organisation is staffed by over 30 volunteer drivers, who drive one or two mornings a month, along with its management committee who are similarly unpaid. Training is provided to our drivers to take the MiDAS test (Minibus Drivers Awareness Scheme). How are we funded? We rely on funding from local government, when on the scheduled bus routes, as well as donations from local town and parish councils in the community that we serve. Currently Central Bedfordshire Council are carrying out a survey and report on how best to reduce spending on public services in the area, which may affect our budgets in future. Raising Funds for a replacement Mini Bus Both our minibuses are now past their best. We take delivery of a new minibus in December with funds raised by ourselves and from sponsorship /donations received from Charitable Trusts & Organisations to say nothing of local Parish/Town/Area Councils. We are also requesting grant funding for the 2nd minibus from the Department of Transport â&#x20AC;&#x201C; Community Minibus Fund â&#x20AC;&#x201C; Round 2, which is being managed by the CTA. (ED: News has since been given that their fundraising has been completed, and a new bus is on order for the end of 2016). mean that buses would stop on the opposite side of the road. Summary compiled by Suzy Scott, using minutes taken by Frances Horwood. This joint meeting was a first meeting in many ways, and also chance for the BABUS representatives to meet new staff members Adrian Hardy and Andy Hamer. On the day of our meeting, work was to begin to construct a turning circle at Engayne Avenue. When it was completed, Service 73 would again serve Engayne Avenue and Service 83 would cease, as it would no longer be required. This change would take place in November. (ED: See Service Changes feature for more details of this). Real Time passenger information, and a shelter, would be fitted at the new turning circle. We asked about the Central Bedfordshire Council consultation on Passenger Transport, and were told that the paper had gone for overview and scrutiny. A breakdown of the responses could be read on the CBC website: in the Consultations section, it may be accessed by selecting Overview and Scrutiny and Sustainable Communities. Then the agenda for a meeting held in September may be read and this includes the information on the responses. The Executive were due to meet the day after our meeting and they would make recommendations to the full council. The full council were due to meet on November 17th. Information regarding the Executive meeting on October 11th would be posted on the CBC website and also sent to stakeholders. and parish councils; they said they had but most of the responses had been from individuals. The proposal for overview and scrutiny was a new way of working out subsidies. There would not be any changes to concessionary travel, with free travel 24 hours a day to continue. Automatic renewal of passes would be discontinued: pass holders would have to renew them upon expiry but this need not be done on line â&#x20AC;&#x201C; a paper application form would be available. However, this would be reviewed as it was envisaged that more and more people would renew their passes online. We asked that, if renewals became online only, perhaps library staff could help people who were unsure how to do this, and we were told that this was a possibility. On November 2nd there was to be a meeting with a company dealing with online applications: CBC was a pilot authority for a Government scheme. The council has both parts of the maps now online, on their website). It was mentioned that, at our Stagecoach Liaison Meeting, we had suggested that they might put route maps on the timetable leaflet for each route, as with Grant Palmer timetables. We asked about the provision of route maps at bus stops. It had been found that some could not be read easily. About three years ago, BABUS had surveyed timetable cases and flags at bus stops in Bedford. Information on Stagecoach services was good but information on other operators â&#x20AC;&#x2DC;services was not so good. The Borough Council had made some progress since then. It was mentioned about stops where flags showed Services 125 and 126; the timetables at the stops were, however, up to date. There are some stops in Bedford Road, Kempston did not show Uno timetables and he thought it possible that they did not show the new Grant Palmer Service 24. We then discussed the Buses Bill (see previous Newsletters). There was nothing to really report on this as the progress of the bill had been held up in the House of Lords and it would be returned to the House of Commons. The bill had potential for urban areas but not so much for Central Beds., which was predominantly rural. Two new vehicles had been purchased. The BABUS representatives had travelled to the meeting on one and found it very comfortable, with an attractive livery. A secondhand vehicle had been painted in the same livery. The timetables of Services 42 and 44 had changed, bringing about improvements at peak times. With the new vehicles operating on Service 42, the Darts formerly used were now operating Service 44, which had increased the capacity. The new Service 24 was in operation, linking Great Denham with Kempston, Bedford Hospital, Bedford College and Bedford town centre. Being a new service, it would take about six months to become established. This route also provides transport to and from Lincroft Middle School. We mentioned problems of buses being up to being 50 minutes late, the reason being that the driver was very late arriving back on another service. Waiting passengers had to go and find out what was happening - though, in fact, Stagecoach had not decided, by the time the bus was 25 minutes late. At no stage did Stagecoach give out any information, except this rather unsatisfactory reply to passengers who had sought information. One problem which was of concern to both the company and BABUS, was the obstruction of bus stops outside Bedford Railway Station by taxis/ private hire vehicles. This had become more of a problem and there was even an incident in which a taxi driver was abusive to a bus user. The company were working with the railway company, since railway bylaws enabled offending taxi/ private hire drivers to be prosecuted; a number of drivers had been prosecuted. Our next meeting is set for the end of January 2017. As ever, please let us know if you have any issues, that you’d like us to discuss on your behalf. Our next Grant Palmer Liaison Meeting is due to take place in January, 2017. As ever, please let us know if you have any issues, that you’d like us to discuss on your behalf. Vehicle breakdowns had been higher than usual when we met in September but had been significantly reduced by the time of our December meeting. The company was continually seeking to minimise breakdowns but winter weather was a factor in some cases. Matters we discussed at our September meeting included the new Service 11, which had not yet been running long enough to be established; diversions on the X5, due to roadworks; vehicle breakdowns, and the way passengers were informed of delays or bay changes. There was little to report on how the new Service 11 was doing as it was still getting established. Some major changes had taken place in November. At our December meeting we were informed that, having waited some months to see how the opening of the Western Bypass would affect traffic congestion, the verdict of Stagecoach was that there was severe congestion at the Manton Lane roundabout, which was causing delays to Service 6, which, in turn, caused lateness on Service 5. Buses could be delayed there for as long as twenty minutes. Congestion in the Midland Road area had also worsened: the traffic conditions which used to be encountered on a bad day had now become commonplace. Service 40 had been withdrawn and the route of Service 41 to and from Northampton had changed, to serve Biddenham and Bromham Village, lengthening journey times for those making longer journeys on the route. Bromham and Biddenham had a halfhourly service to and from Bedford as they were also served by an hourly No.41 to Stagsden. The route of the No.73 had changed: it was now serving the Engayne Avenue area of Sandy again, since a turning circle had been constructed so that buses could turn safely. The need for resurfacing at Bedford Bus Station had been mentioned at earlier meetings. This was now under way, with services affected by bay closures using River Street during the day and all evening services using the Hub area of the bus station. This, the second and most difficult phase of the work, was almost completed, with work having continued during the night. Service 81 would be the last one to move back to the bus station. The final phase would affect the layover bays and cause the exit to be narrowed. Other changes were to take place in January; these are detailed elsewhere in the newsletter. Our next meeting with Stagecoach is due to take place in early March 2017. As ever, please let us know if you have any issues, that youâ&#x20AC;&#x2122;d like us to discuss on your behalf. By Simon Norton Here is a report on how the visit to Kimbolton Castle advertised in Newsletter 30 turned out. The castle dates from mediaeval times and is best known as the home of Katherine of Aragon. While there have been some alterations over the centuries, most of the basic structure has not been changed. The building now houses an independent school. (b) The 6 from Peterborough also had slight problems finding the pickup point at Huntingdon station. (c) Having given my mobile number and email address in case of emergencies, I then found my phone had conked out when I tried to collect messages after boarding the bus from Cambridge. Incidentally I went out via Bedford and returned via Huntingdon, where I visited a phone shop and had the phone rebooted. The remaining 5 participants included 2 BABUS members travelling to/from Bedford, and 3 from Cambridge of whom 1 went by bus to St Neots returning via Bedford and the other 2 went by car. The local historical society organises occasional open days, which however are always on Sundays when there aren't any buses. However, it also does group tours at other times when the building is not used by the school. Normally they require a minimum of 15 visitors but they agreed to waive that requirement when I explained how I'd never been able to visit because of transport problems. We had excellent guides and everyone found the tour very enjoyable. Afterwards we had a chance to look round other places of interest within the village. People have asked whether I am planning any further trips. Well, does anyone have any ideas for places to go? The condition is that they should not normally be visitable by public transport users travelling on their own -- either they are only open to prearranged groups or, if they do have public open days, these are not aligned with bus times. I don't know of any such places in the Bedford area, but further afield (for Bedfordshire people) there's the historic church at Wood Walton (which can be seen from trains between Huntingdon and Peterborough) and the duck decoy at Borough Fen near Peterborough, both of which require a significant amount of walking so might not be suitable for some of the Kimbolton participants. been repainted in this livery, which will be used from now on. A Grant Palmer vehicle was written off in an accident on the Luton Busway. Centrebus lent GP a replacement vehicle, which they have now bought and repainted. The company had a full complement of drivers. There were still problems at Bedford Railway Station regarding parking by taxis and private hire vehicles at the bus stops outside the station. In addition, minibuses for warehouse workers used the stops, as did coaches from holiday companies. The land is owned by the railway company. Onto Milton Keynes, and we heard that the council have combined Highways and Bus Operations under a new division called Public Realm. There had been redundancies and the Passenger Transport Manager had left. Two new bus routes had begun operating. Grant Palmer No.24 goes from Bedford to Great Denham, via the Hospital and Kempston, with morning and afternoon journeys to and from Lincroft Middle School in addition to the regular service. Stagecoach No.11 goes from Bedford to Great Denham via Bedford Rail Station. Great Denham already had the No.8, which goes via Queen’s Park, so residents now have three bus routes. This followed requests from the Great Denham Parish Council for improvements in their local bus services. A consultation regarding concessionary fares in Bedford Borough had just taken place. The Council proposed replacing 24hour free travel with a £1 fare for travel within the Borough before 09.30. Central Bedfordshire had held a Consultation on Passenger Transport: BABUS had a meeting with CBC coming up and expected to get some news on the progress of the consultation then. At Bedford Bus Station, potholes needed to be filled; there is a problem with ponding after heavy rain. A local newspaper had claimed that the local council intended to close the Travel and Tourism Centre in order to make savings. There were subsidised contracts for evening and weekend services and MK Council tried to save £40,000 by putting out a bulk contract to all operators. Bids were sent in and many of the routes were awarded to Z and S. Routes 1 and 2 were being operated by Arriva during the day and by Z and S in the evening. Far from making a saving, the cost increased by £20,000. At the same time, the owners of Z and S Buses have been unwilling to have contact with user groups. MKC have given a guarantee, in writing, that no cuts would be made to bus services but this could not be relied upon. We then heard of problems with roadwork problems where Ridgway (roadworks contracts) did not inform either the Council or bus operators. However, the new Director of Public Realm had called in the senior managers and it was possible that Ridgeway would lose the contract. They used subcontractors to carry out work. If roads were closed, this caused major problems, since 115 buses an hour pass through Central Milton Keynes. MKBUG had pressed for work to be done at night. Improved communication would help. towns where buses ran through the central area: Milton Keynes topped the list for volume of bus traffic. We said in n Bedford, the opening of the Western Bypass had had an adverse effect on traffic on the A6, Manton Lane and Shakespeare Road, resulting in longer queues. PB said consultants had produced a pollution map which showed high pollution in CMK, which was sited on a hill. As Milton Keynes is laid out on a grid pattern, this had resulted in the centre of each grid square being polluted. There was to be another consultation regarding gridlock; MKBUG was lobbying people who were pro-bus, in order to overcome those who were pro-car. There were two new services, 301 and 15, serving Oakgrove and the Western Expansion Area. Section 106 money had been used for this. The two services would probably merge and two buses would then be used, instead of one. The facilities at Bletchley Railway Station were delayed; it had been found that utilities had been laid in the disused underpass. Subsidies were a matter for concern and concessionary fares would be looked at, with less money being received from Central Government for these. The amount per journey had gone down from ÂŁ1.09 to 89p and may be reduced to 79p. BABUS said Bedford Borough had just held a consultation; they were proposing to charge a ÂŁ1 concessionary fare within the Borough before 09.30, instead of free travel 24 hours a day, as at present. He was against this change and would prefer, if a charge had to be made, for the fare to be 50p. PB said Milton Keynes had had a 50p fare within the Borough before 09.30 but had raised it to halffare; however, MKBUG had succeeded in getting it reduced to ÂŁ1, which was easier for drivers from the point of view of giving change. Tickets for schoolchildren had similarly been reduced. Smart ticketing would be introduced in Milton Keynes. So there was support for bus travel but some Conservative councillors favoured car travel and new car parks were to be built, including multi-storey one in CMK. student flats, retirement accommodation and a six bay coach station. There were no plans to increase parking provision. It was proposed to improve access from the Grosvenor Centre. The present dual carriageway would be made single. By the time this development opened, Rushden Lakes would be open. Since local authorities no longer have specialists such as architects, the plans would be drawn up by the developers. Bicester. Service 89, from Northampton to Milton Keynes, now had a reduced service on Saturdays. There are longterm road works between Roade and Grafton Regis. The X7 may be diverted via Hanslope and Hartwell. It was said that, if the situation were to worsen, there was a plan for a shuttle service, if required. From October 23rd, X7 journeys which now terminate at Kibworth would be extended to Leicester. This would give a half-hourly service between Northampton and Leicester. Weekly and monthly ticket prices had been revised. Our next meeting with other groups is in February 2017. Meridian had started a service from Lavendon to Milton Keynes on a Sunday - four journeys in each direction. The positioning journey in the morning (dep. Northampton 10.00, arr. Lavendon 10.25) and the early evening one back to Northampton were operated as a public service, although it seemed unlikely that there would be a demand at those times. By Suzy Scott As we have a quarter-page free, I thought it would be time to catch you up with what I am still doing in BABUS. At the AGM I had intended to stand down, but continue to do the Newsletter, Website, Bulletin Board, Social Media, email and call handling, and such forth that comes with the Comms Officer’s role. I was asked by Colin Franklin to remain on the committee, albeit on a part-time basis (i.e. to continue with what I do, but not to attend all meetings and expand the role), pending anyone stepping forward in the future. So, for now, I continue… until someone (or more than one person) comes along better qualified than me, OR until health decides otherwise. That continues until further notice. For now, I would welcome hearing from anyone who would like to hear from people who would like support me in this work, now or in the future. • EOS London / EOS Buses – all services. • Landmark Coaches – all services except schools. • Metroline – Services 84/84A, 242, PB1 only. • Mullany’s Coaches – all services, except schools and 311 to Warner Bros Studios Tour London, as they set the fares for this. • Red Eagle – all services, except school services. • Red Kite – services contracted to Herts County Council only. • Redline – services contracted to Herts County Council only. • Red Rose – all services, except school services. • Richmonds Coaches – Services 16, 90/91, 386 throughout. • Stagecoach East – Services 71, 72 Hitchin-Bedford only, plus Service 26 Royston-Cambridge as far beyond Royston as Melbourn. • Stephensons of Essex – Sevice 5 and 301 only. • Sullivan Buses – all services except TfL Services, school services, and Services 950 to Thorpe Park. Valid on Service 951 between Potters Bar and Denham only. • TrustyBus – all services except school services. • Uno – all services except school services, TfL Service 383. These are not sold or accepted on services for Cranfield University, Moulton College, and services in Northampton. • Viceroy Of Essex – all services except school services. Buy from the bus driver, on the first bus you board. By Suzy Scott, with material from Arriva, Centrebus, Central Bedfordshire Council, Frances Horwood, Flittabus, Hertfordshire County Council, and Stagecoach East Following a period of somewhat calm (albeit the odd five minutes here and there), now comes the inevitable deluge, with some major changes right at the start of 2017. We have below a list of permanent changes, and you can find our usual Christmas/New Year changes feature on Page 31 In this listing, we show things in date order. There are some services changing twice in quick succession, so we ask you to read to the end, to get the full picture. From w/c 29th August 2016 Centrebus Service 391 (Stotfold – Baldock – Lister Hospital – Stevenage) Service withdrawn, following cessation of support from Hertfordshire County Council. minutes different until 10.46. The 11.17 ex Ampthill to Clophill will also serve Maulden, Wingfield Avenue (previously by request only) at 11.42, meaning the last run at 11.48 runs a little later throughout. Flittabus Service FL6B (Lidlington – Ampthill – Silsoe – Flitwick, Thursdays Only) 09.10 from Lidlington to Ampthill will be diverted to pick up at Silsoe, Aspen Way, at 09.38. From there, the bus runs a little later to Amphtill. As a result, the 10.05 Ampthill – Flitwick runs a few minutes later. Then no changes until the last run at 11.48 from Flitwick, where new request stops are added at Windmill Road, Rufus Centre, Hinklsey Road at Ellenshaw Court, and Silsoe, Aspen Way. Flittabus Service FL7 (Silsoe – Apthill – Flitwick, Fridays only) 08.40 freom Maulden to Silsoe now arrives in Silsoe five minutes later. 10.00 from Silsoe to Flitwick will now run five minutes later throughout. Return service at 11.45 from Flitwick now serves Silsoe by request only, meaning the 12.18 from Silsoe is the same. Flittabus Service FL8 (Maulden – Houghton Conquest – Bedford Town Centre and Cardington Road Tesco, Wednesdays Only) Return bus from Bedford (16.15) now serves Maulden only by request. Saturdays Only) Second journey starts considerably earlier from Ampthill (was 12.11 now 11.48), to allow a call at Ampthil, Wagstaff Way, and arrive at Toddington 12.38. The 09.55 from Toddington to Ampthill is similarly retimed, serving Wagstaff Way at 10.36. 13.04 from Toddington to Eversholt will serve Rads End on request only. From w/c 27th November 2016 Stagecoach Bedford Service 40 (Bedford Bus Station – Bromham – Milton Keynes) Service 40 is to be withdrawn as a result of the withdrawal of the partial subsidy from Milton Keynes Council. Within Bedfordshire, changes are mentioned under Service 41 (below) For replacements over the rest of the route, changes are made to a Service 37. This is currently Olney - Stoke Goldington Newport Pagnell – Wolverton, but it is to be change. Newport Pagnell to Wolverton section will be replaced by serving Chichley and Astwood. Instead of being operated by Vale Travel, it will be operated by Red Rose. Flittabus Service FL9 (Wilstead – Littleworth – Shortstown – Bedford Cardington Road Tesco and Town Centre, Wednesdays Only) Return bus from Bedford (15.01 but now 15.00) is revised to pick up Tesco, St Paul’s Square, then serve all stops by request only. Stagecoach Bedford Service 41 (Bedford Bus Station – Bromham – Olney – Northampton) Following withdrawal of the 40, Service 41 is doubled to every half hour from Bedford to Bromham, with all buses serving Biddenham, as well as all of Bromham (i.e. Darlow Drive, Swan, Springfield Drive and the Mobile Home Park). The short journeys terminating at Bromham will then extend to Stagsden, to maintain links to this area. The timetable has also been revised, hopefully to increase reliability (see Editor’s comments in the last newsletter!) . Flitwick) Minor changes to the timetable, to improve reliability. From w/c 4th December 2016 Stagecoach Bedford Service 73 (Bedford Bus Station – Sandy – Biggleswade) Service will now serve Egayne Avenue in Sandy once again, with the installation of a new bus turning circle and shelter installed by this time. This was removed as a reversing point because of risk factors from Stagecoach. As a result, more changes to the timetable are happening, and it is enclosed. However, please be aware of further changes in January – the weekend evening journeys are coming off then, but will still run in December. The timetable shown is from January, but that is the only change. Herbert’s Travel Service 83 (Sandy Local Service) As a result of the 73 being able to serve Egayne Avenue once again, this service will be withdrawn. • 08.02 51 (both SDO and NSD) from Oakley to Bedford, will run five/six minutes later. • 17.45 51 from Bedford will now arrive a little later throughout from Clapham to Rushden, meaning that the 18.50 51 from Rushden to Bedford runs five/six minutes later. No change to the number of journeys or services. Please see timetable (further on) for more details. Stagecoach Bedford Service 52 (Bedford early morning and Marsh Leys Industrial Estate buses) Service withdrawn in it’s entiriety. We were not aware of any replacements at the time of finishing this Newsletter on Tuesday 6th December 2016. Stagecoach Bedford Service 53 (Milton Keynes – Cranfield – Wootton – Bedford Bus Station) Service withdrawn between Cranfield University and Milton Keynes. This section of route remains covered up to twice per hour, by Uno.  Buses will still leave Bedford around 15 (Cranfield), 35 (Wootton) and 55 (Wootton) from Bedford Bus Station, but will get about four minutes more running time. As a result, return buses from Wootton are now at 19, 39, 59 past, with the one bus from Cranfield now leaving at 23 past the hour.  Check your new timetable carefully, as a result of these changes. 20.40 and 22.40 returns from Hitchin, are withdrawn. The last Monday-Saturday buses on this route now become 18.05 (71) and 18.35 (72) from Bedford, and 19.10 (72) and 19.40 (71) from Hitchin. The evening service was formerly supported by Central Bedfordshire Council. Stagecoach Bedford Service 73 (Biggleswade – Sandy – Bedford Bus Station) Entire evening service, consisting of the 20.00 and 21.40 Friday/Saturday from Biggleswade, and the 20.50 and 22.50 Friday/Saturday returns from Bedford, are withdrawn. A new timetable, which combines these with the December and January changes, can be found further on. Stagecoach Bedford Service 74 (Biggleswade – Cople – Cardington – Bedford Bus Station) Service withdrawn by Stagecoach in it’s entirety. See next entry for a replacement service. NEW SERVICE Grant Palmer Service 74 (Biggleswade – Cople – Cardington – Bedford Bus Station) New hourly service, replacing the route withdrawn by Stagecoach in Bedford. The level of service will be pretty much the same as now, but there are a few minutes’ change on almost all journeys. Please see timetable (further on) for more details. services. Now, it’s a 15 minute combined service of two half-hourly routes, improving service to all areas. Buses will operate alternately as 100 (as now via Luton Airport), and 101 (rerouted to include Great Offley, Lilley and Buttterfield). Presumably the upgrade to Sapphire status earlier this year, has had a positive effect on passenger numbers!  Timetable changes by Centrebus from 1st January 2017 include Services 17/17A (Luton – Wigmore Lane Circular) having a new timetable. Christmas 2016 and New Year 2017 bus service arrangements for the Bedfordshire Area Arriva Summary of Services On Christmas Eve & New Years' Eve, buses will gradually reduce in the evening in all areas, with all services withdrawn by approximately 9pm. Most services will operate to Saturday timetables between Christmas & New Year, however there are a few exceptions noted in local information below. Some services will run to special timetables on Christmas Day, Boxing Day and New Years Day - full details of timetables are given below. Friday 30 December 2016 - Saturday service. Saturday 31 December 2016 (New Year's Eve) - Saturday service until approximately 1900 (Busway A Saturday service until approximately 2200) Sunday 1 January 2017 (New Year's Day) - Sunday service on selected routes starting 0800. Monday 2 January 2017 - Sunday service. Tuesday 3 January 2017 - Normal services resume. Luton â&#x20AC;&#x201C; London GreenLine Services Friday 23 December 2016 - Normal service. Saturday 24 December 2016 (Christmas Eve) - Saturday service until approximately 2230. Sunday 25 December 2016 (Christmas Day) - No service. Monday 26 December 2016 (Boxing Day) - Weekend service starting at 0300. Tuesday 27, Wednesday 28, Thursday 29, Friday 30 December 2016 Weekend service. Saturday 31 December 2016 (New Year's Eve) - Weekend service. Sunday 1 January 2017 (New Year's Day) - Weekend service Monday 2 January 2017 - Weekend service. Tuesday 3 January 2017 - Normal services resume. Flittabus Flittabus will not be operating on Monday 26th & Tuesday 27th December 2016 & Monday 2nd January 2017, but will be running the regular days of the week service on all other days in the festive period. Grant Palmer Saturday 24th December 2016 – Normal Saturday Service Sunday 25th December 2016 – No service as normal Monday 26th December 2016 – No service as normal for Bank Holidays Tuesday 27th December 2016 – No service as normal for Bank Holidays Wednesday 28th December 2016 – Saturday Service Thursday 29th December 2016 – Saturday Service Friday 30th December 2016 – Saturday Service Saturday 31st December 2016– Normal Saturday Service Sunday 1st January 2017 - No service as normal Monday 2nd January 2017 – No service as normal for Bank Holidays Tuesday 3rd January 2017 – Normal service resumes. Ivel Sprinter Ivel Sprinter will not be operating on Monday 26th & Tuesday 27th December 2016 & Monday 2nd January 2017. Stagecoach in Bedford (includes X5) We will be running amended timetables over the Festive period heading in to 2017. Details can be found starting on the next page. Wanderbus Whitbread Wanderbus will be running all our service as normal until the end of the day on Friday 23rd December 2016. There will be no services on/between Saturday 24th Dec â&#x20AC;&#x201C; Monday 2nd Jan, except for the followingW1 & W2 Bedford on Wed 28th Dec W5 Baldock, W6 Shefford local service, W7 Letchworth & Baldock, on Fri 30th Dec. Regular schedule will resume on Tues 3rd Jan. 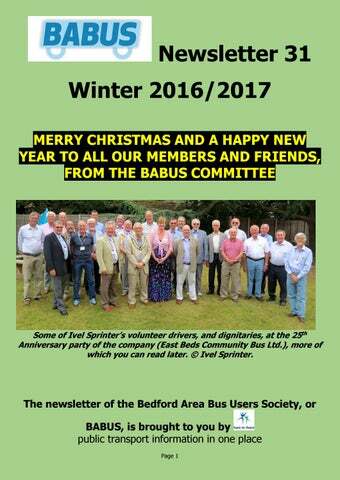 The Winter 2016/2017 Newsletter of the Bedford Area Bus Users Society. Includes the annual Christmas/New Year service guide.